As more people try to cut down on plastic use and landfill contributions by embracing the Zero Waste movement, things like composting are becoming more common. First things first: What is compost? 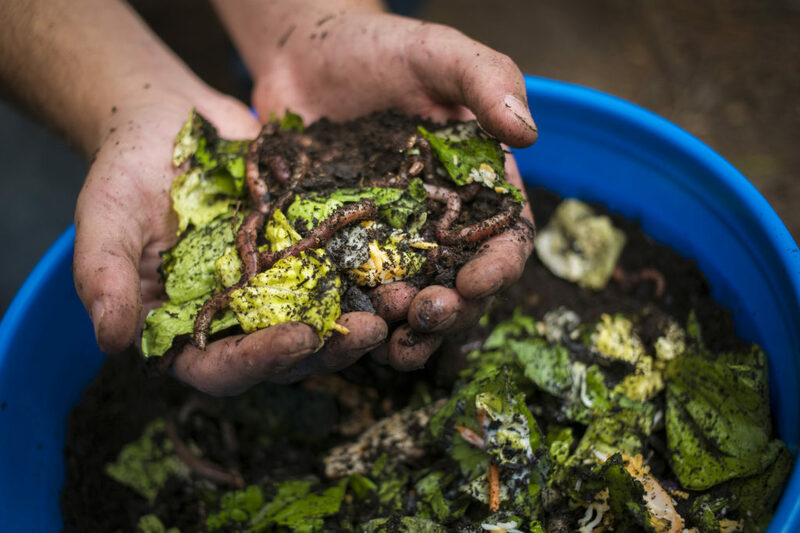 The Environmental Protection Agency describes compost as “an organic material that can be added to soil to help plants grow.” It can be done in homes with yards or apartments, and has minimal costs to get started — all you need is a container. Plus, it can cut as much as 30 percent of your household’s waste out of the trash can. That’s better for the environment by adding nutrients back to the soil, and by cutting down on what goes into landfills. Compost ingredients are divided into “greens,” “browns” and water. “Greens” are things like grass and vegetables scraps, while “browns” are carbon-rich items like cardboard, leaves and twigs. Composters recommend an equal ratio of browns to greens, with a healthy amount of water to help break down the matter. If you’re composting outside, pick a dry, shady spot close to a water source. You’ll need to mix or turn the compost regularly, and keep it moist. For both indoor and outdoor compost piles, your compost is ready to use when the bottom is a dark, rich color. For smaller indoor piles, that is typically two to five weeks; for large outdoor piles, it could be two months to a few years. If you don’t have use for the soil yourself, see if you can bag it up and sell it, give it to a friend or donate it to a local community garden. "Composters recommend an equal ratio of browns to greens, with a healthy amount of water to help break down the matter." While many people have a compost pile in their backyards (which can turn into a decorating opportunity, with a little creativity), it’s also doable for apartment dwellers. You’ll need a plastic or ceramic container, sized according to your needs and available space. Experts recommend keeping it in a cool spot that gets plenty of sun. If you don’t have an out-of-the-way place to keep it, consider a decorative bin, like this cute option from Chef’n. Not only will it add to your apartment’s decor, it could even spark conversation with visitors and inspire others to follow your lead. Other helpful tools you will probably need are a pitchfork or garden trowel, shovel and water hoses with a spray head. Most food items that you might normally throw away are great compost candidates. Fruits and vegetables and eggshells make great compost, as do coffee grounds and filters, tea bags, nut shells and shredded newspaper. Cardboard, paper, yard/grass clippings, houseplants, hay and straw, leaves, sawdust, wood chips, cotton and wool rags, dryer and vacuum cleaner lint, hair and fur and fireplace ashes are all compostable as well. When things like this are put into a landfill, they don’t typically have the proper air access to decompose properly. That adds more methane gas into the environment. Some food items, on the other hand, like meat or fats/grease should NOT be composts. Here’s a full list of items that shouldn’t be composted.